Diamond´s sister ex, Petitman Karata has come out publicly to parade his new lover with sensual videos depicting the two are one, but she is way too old for him. Petitman and Diamond´s sister, Esma broke up just months ago and is now cuddling with withered Tanzanian artist and actress Sister Fey. 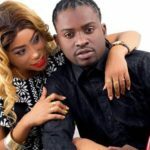 Aging Tanzanian singer and actress, Sister Fey Endless sensual photos and videos shared [now blocked] on social media depicted the two are in love but fans think it is a waste of time and a game of cards. The video was captioned: OHOO!!! Mpambe wa wemasepetu, Petitman Ajiweka kwa Sister Fey… Mahaba Kama yote…. Hapa wamejirekodi wakiwa chumbani. Fans boldly came out to lash out at the two with mean and gross comments asking the two to keep their messed up ´love life´ private. According to the fans, the two just have confused love lives, with such a messed up past in their separate relationship lives. Petitman Fey is just too worn out for Petitman, fans say. Others are just too irritated by the move the two have made, since according to the fans, these two are fooling their fans, which they will not allow. Additionally, it seems to many, that soon after their series of failed relationships, the two rushed into a new one, abruptly. Petitman was fasing accusations of infidelity, that led to his failed relationship with Diamond´s sister, Esma. Diamond´s siter, Esma Khan with ex-husband, Petitman On the other hand, Fey was dumped by her over, hardly 2 months ago. So question fans are asking is: Is this real or atre the two trying to fool the world? The post Diamond´s sister ex-husband now cuddling with woman too old for him appeared first on Ghafla! Kenya.